An analysis of subsale transactions by Savills Singapore has shed light on the sort of short-term property speculation in the Singapore non-landed private housing market last year that culminated in the government announcing a punitive seller’s stamp duty regime. At least 20 units were bought last year and flipped within days. They involved mostly smallish apartments in projects such as Dorsett Residences at New Bridge Road, Suites@Topaz in the Serangoon-Moonstone Lane area, Centra Suites in Geylang, Haig 162, One Amber, The Shore Residences and Suites@Shrewsbury. Profits generated by these 20 units which changed hands within 29 days ranged from $5,000 to $188,000, translating to returns of 0.6 per cent to 27.6 per cent. In all, there were 111 subsales of private apartments and condos in 2010 which had previously changed hands in the same year. All of these transactions were profitable. Gains ranged from $5,000 to $2.08 million per subsale transaction. The latter was recorded for a 3,907 square foot unit at Urban Suites near Cairnhill Road which was bought in late January 2010 for $8.81 million from the project’s developer and flipped in early March for $10.89 million. The smallest gain of $5,000 was for a 926 sq ft unit at Waterview in Tampines which involved a 10-day holding period. Savills Singapore traced caveats for subsale transactions for private apartments and condos against previous caveats for the same units. It found earlier matching caveat records for 86.7 per cent or 2,917 of the 3,365 total caveats lodged for subsales of private apartments and condos last year. The 111 units subsold last year which had been previously transacted within the same year made up 3.8 per cent of the 2,917 total subsales that Savills matched for the whole of 2010. And the 20 units flipped within days of being purchased in 2010 accounted for 0.7 per cent of total subsale matches last year. The punitive seller’s stamp duty (SSD) regime that the government unleashed on Jan 13 this year has had an impact on cooling property speculation. Savills’ analysis revealed that none of the subsales in Q1 2011 involved units which had been bought within the same period. Analysts say that it would be challenging for speculators now to buy a private home and flip it within a year given the higher hurdle to break even following the introduction of the 16 per cent SSD for those who buy a private home after Jan 13 and sell it within a year. Foo Suan Peng, managing director of investment sales at Knight Frank, said: ‘The property’s price would have to move up at least 20 per cent for the investor to break even (comprising 16 per cent SSD if the property is held for a year or less; 3 per cent buyer’s stamp duty; and one per cent for other costs). 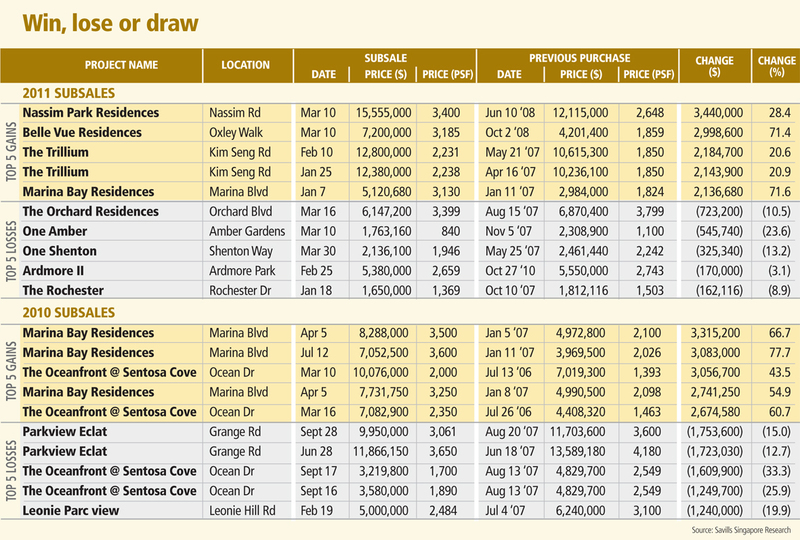 Savills’ analysis showed that in Q1 2011, there were 22 subsales which yielded gains exceeding $1 million each, of which six cases reflected gains exceeding $2 million each – in projects such as Marina Bay Residences, The Trillium (two units), Belle Vue Residences, Nassim Park Residences and One Amber. The 22 subsales involved units which had been previously transacted in 2006-2009 and made up 4.3 per cent of the 506 subsale matches Savills traced in Q1. Last year, there were 92 subsales (or 3.1 per cent of 2,917 subsale matches in the period) which produced a profit of over $1 million each. These included 14 deals with gains surpassing $2 million apiece, nine of which were at Marina Bay Residences. Last year’s most profitable subsale deal (in absolute terms) generated a gain of $3.3 million; it involved a unit at Marina Bay Residences which had been previously bought for $4.97 million in January 2007 and subsold for about $8.29 million in April 2010. In Q1 2011, the most profitable subsale deal (in absolute terms) generated a profit of $3.44 million, on a ground floor unit at Nassim Park Residences previously bought for around $12.1 million from the developer in June 2008 and sold in March 2011 for $15.56 million. In percentage terms, Q1 2011’s most profitable subsale yielded a 167.4 per cent return – on a unit at SouthBank at North Bridge Road that had been bought from the developer in June 2006 for $561,000 and sold in the subsale market in January 2011 for $1.5 million. The majority or 69.4 per cent of the 506 matched subsale deals in Q1 this year involved units previously bought in 2007 or 2009. It was a similar trend last year, when 73.8 per cent of the 2,917 matched subsales involved units previously purchased in 2007 or 2009. Jack assists homebuyers & investors to identify suitable properties to buy or invest in. do not hesitate to contact him @ +65-9337-8483. This entry was posted in News and tagged Belle Vue Residences, Caveats, Centra Suites, Dorsett Residences, English Property News, Marina Bay Residences, Nassim Park Residences, One Amber, Savills Singapore, Seller's Stamp Duty, Singapore, SouthBank, Subsale Activity, Suites@Shrewsbury, Suites@Topaz, The Shore Residences, The Trillium, Urban Suites, Waterview. Bookmark the permalink.